The tour kicks off today at the Ace of Spades in Sacramento, CA – See ya there! This special ‘VIP Package Upgrade’ is being offered for $100, which is a bit of a discount in comparison to previous tour packages. They can be purchased up to 3 days before a show. You will be contacted via email approximately three days prior to show date with instructions for your package elements. This run will be the third leg of the Anthrax/Testament/Death Angel hat-trick; the three bands packed five weeks worth of venues coast-to-coast last Fall, marking the first time Anthrax and Testament had shared a stage in more than a decade; again, earlier this year, the line-up played another dozen dates to headbangers in cities from Las Vegas to New York. For Anthrax – Scott Ian/guitar, Charlie Benante/drums, Rob Caggiano/guitar, Joey Belladonna/vocals, and Frank Bello/bass – this run of dates will follow the band’s summer-long slot on the Rockstar Energy Drink Mayhem Festival where they will headline the tour’s Jagermeister Stage, playing a special “bare bones, guerrilla” performance. The Mayhem tour, as well as these dates with Testament, are in support of Worship Music, Anthrax’s first new album in eight years, and the first with Belladonna on vocals in twenty years. The album debuted at #12 on Billboard’s Top 200 Albums chart, has received stellar reviews and been called “the metal album of the year” by numerous critics and music tastemakers, including VH-1/That Metal Show’s Eddie Trunk, and Alexander Milas, editor of the UK’s Metal Hammer. Worship Music also landed on copious amounts of “year-end-bests” lists, and the editors of Loudwire named it their #1 Metal Album of the Year, with the track “The Devil You Know” claiming the #1 Metal Song of the Year honors. Anthrax’s worldwide sales have exceeded 10-million and the band has received multiple Gold and Platinum albums, numerous Grammy nominations, and a host of other accolades from the press, industry and fans. Few bands have the capability to survive lineup changes, health crises and over 25 years of recording and touring, only to come out the other side primed to impress once again. Legendary Bay Area thrashers TESTAMENT are one of the few living legends of the thrash metal scene who are able to evoke the same strong emotions as they did in the 80s and who truly grow with each album without abandoning the substance and integrity they are known for. With their upcoming effort, Dark Roots Of Earth, they have proven once again that there is no stopping their relentless talent! TESTAMENT will start work on a brand new music video promoting their upcoming record Dark Roots of Earth before a European and U.K. festival run. 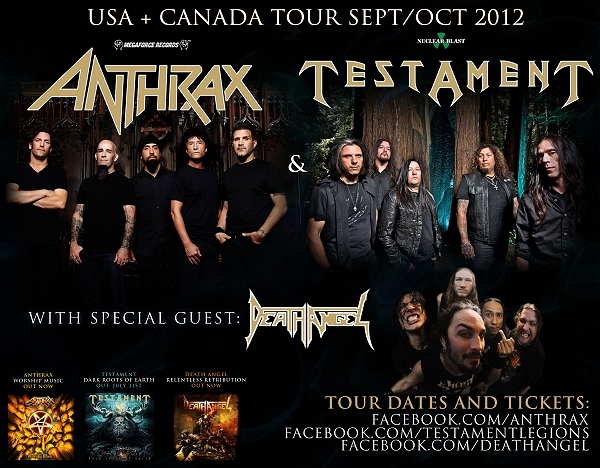 Soon after, they will return to the U.S.A. for a third leg of the ANTHRAX/TESTAMENT tour. TESTAMENT return with their highly anticipated follow-up album in the form of Dark Roots of Earth on July 27, 2012 (Europe) and July 31, 2012 (North America). The record will also be released in a special edition format which will include a DVD and bonus tracks. Produced, mixed and mastered once again by the world renowned Andy Sneap (ARCH ENEMY, NEVERMORE, ACCEPT, EXODUS), along with bonus tracks recorded, mixed and mastered by Juan Urteaga (MACHINE HEAD, CATTLE DECAPITATION, HEATHEN, VILE,SADUS), expect the bar by which we judge all things thrash to be raised! 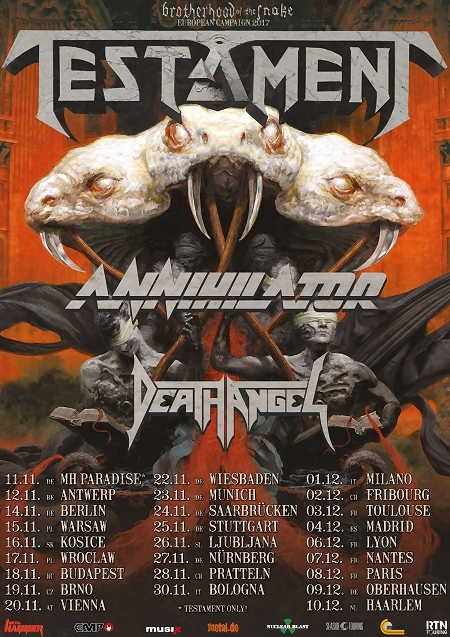 Bay Area thrash legends DEATH ANGEL will be touring in support of their latest release Relentless Retribution, which recently landed at position No. 10 on the Top New Artist Albums (Heatseekers) chart, making it their highest charting record since the band’s reformation in 2004. Relentless Retribution was recorded at Audio Hammer Studios in Sanford, Florida with production genius Jason Suecof (TRIVIUM, AUGUST BURNS RED, THE BLACK DAHLIA MURDER, ALL THAT REMAINS, WHITE CHAPEL, DEVILDRIVER). The savage cover art was handled this time by Brent Elliot White (JOB FOR A COWBOY,CARNIFEX, WHITECHAPEL). Geffen Records was impressed enough with DEATH ANGEL’s television premier to offer the band a deal, and DEATH ANGEL became the first band of their breed to appear on the major label’s roster. At Geffen, the band released what is widely regarded as one of the most original and accomplished thrash metal albums ever recorded, Act III. The record pushed the limits of the genre to create something truly unique, a definitive work that is essential to any metal fan’s music collection. Death Angel’s masterful songwriting ability was once again on display nationwide in 1990, as the videos for “Seemingly Endless Time” and “Room With a View” saw heavy rotation on MTV. DEATH ANGEL’s trajectory to fame was tragically cut short in 1990, when the band’s tour bus crashed in the Arizona desert. Original drummer Andy Galeon was critically injured, and would need more than a year to recover. During this downtime, vocalist Mark Osegueda left the band and moved to New York to pursue a life outside of music. The remaining members went on to form The Organization, and released two full-length albums under that name. The next year saw DEATH ANGEL supporting Metallica at the Fillmore in San Francisco as well as supporting Anthrax and Halford in the US. What began as a gathering of positive vibes for a friend turned into a full time mission to continue a journey that began so long ago. In 2004 DEATH ANGEL released their long awaited fourth studio disc, The Art of Dying; on Nuclear Blast. Since then the band has released two more records and has proved beyond a shadow of a doubt, with those releases and their live show, that thrash is alive and well and that DEATH ANGEL is here to stay! Don’t miss your VIP opportunity to MEET THE BAND when you purchase the TESTAMENT MEET & GREET PACKAGE! 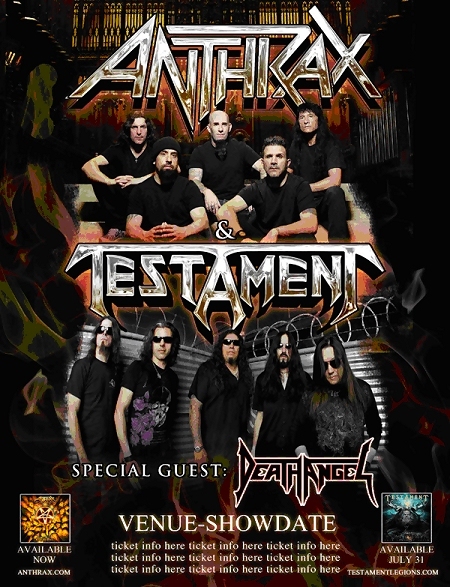 Bay Area thrash kings TESTAMENT are pleased to announce that they will again be offering special VIP/Meet & Greet Packs on their upcoming co-headlining tour with Anthrax with support from Death Angel. This is your chance to spend intimate, quality time with TESTAMENT– up close and personal! TESTAMENT offered these packs on last year’s monumental American Carnage Tour also featuring Megadeth and Slayer, which presented fans with a unique and exclusive chance to spend time with the band before doors opened, take photos and get autographs, throw up the horns, and chat. This year with the VIP/Meet & Greet Packs, fans will have another chance to hang out, sign autographs and take photos with the band, as well as have access to a ticket to their performance, special merchandise hand-picked by the band, and a collectible TESTAMENT laminate to commemorate this ultimate fan experience! For more information on how to obtain your special VIP/Meet & Greet Pack, head over to www.slotix.com now!